Disconnect, breathe, and refocus. 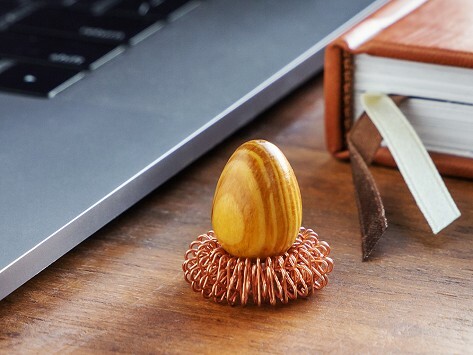 The Thinking Egg is a small but meaningful mindfulness tool made to help you recenter in the midst of busy days and lives. Each egg is crafted from an organic material with meaning, chosen for its belief to help manifest different goals, like lava stone for strength and pine for concentration. It's made to fit perfectly in your palm or keep one in your pocket or rest it in its copper nest. Weight: Lava: 0.01 lb. ; Pine: 0.006 lb. ; Howlite: 0.024 lb. ; Brass: 0.056 lb. ; Complete set: 0.18 lb. The Thinking Egg Maker Oscar Bonilla, Jr. wanted to slow down, but that was easier said than done with his busy life. Being raised by parents who were constantly working made him realize he wanted—and needed—something different for himself. His solution is a small but mighty one. The Thinking Egg is a mindfulness tool made to help folks refocus, be more present, and, yes, slow down. Oscar chose the egg shape for its symbolism of life and promise. And he made it fit in the palm of your hand, to both feel good and be easy to have on you. This simple approach is made more meaningful with the organic materials Oscar chose for his eggs, each thought to help manifest what you want in your life, like lava stone for strength and pine for concentration. Turning off life might seem like an impossible task, but with an egg on your desk, in your pocket, or in your hand, it's a little bit easier to take a break and breathe.